Doctor-assisted suicide could save Canada tens of millions of dollars annually by avoiding costly “end-of-life” care, according to a provocative new analysis.The savings — up to $139 million annually — will almost certainly dwarf the costs associated with helping dying patients kill themselves, University of Calgary researchers report.The authors go to pains to state they aren’t suggesting people be voluntarily euthanized to save money. “Neither patients nor physicians should consider costs when making the very personal decision to request, or provide, this intervention,” they write in this week’s issue of the Canadian Medical Association Journal.However, their attempt to cost out the controversial practice is an issue many have avoided touching. Look around you, people of the internet. The bots. They’re everywhere.Most website visitors aren’t humans, but are instead bots—or, programs built to do automated tasks. They are the worker bees of the internet, and also the henchmen. Some bots help refresh your Facebook feed or figure out how to rank Google search results; other bots impersonate humans and carry out devastating DDoS attacks.Overall, bots—good and bad—are responsible for 52 percent of web traffic, according to a new report by the security firm Imperva, which issues an annual assessment of bot activity online. The 52-percent stat is significant because it represents a tip of the scales since last year’s report, which found human traffic had overtaken bot traffic for the first time since at least 2012, when Imperva began tracking bot activity online. Now, the latest survey, which is based on an analysis of nearly 17 billion website visits from across 100,000 domains, shows bots are back on top. If you are dependent upon an embedded medical device, should the device that helps keep you alive also be allowed to incriminate you in a crime? After all, the Fifth Amendment of the U.S. Constitution protects a person from being forced to incriminate themselves.Nonetheless, that’s what happened after a house fire in Middletown, Ohio.WCPO Cincinnati caught video of the actual fire, as well delivered news that the owner’s cat died in the fire. As a pet owner, it would be hard to believe that a person would set a fire and leave their pet to die in that fire. The fire in question occurred back in September 2016; the fire department was just starting an investigation to determine the cause of the blaze. Does the battery on your phone run out too soon? What about your camera or GPS? To solve this everyday dilemma, Hahna Alexander, co-founder and CEO of SolePower, developed a removable insole for shoes, enabling wearers to charge their devices as they walk. 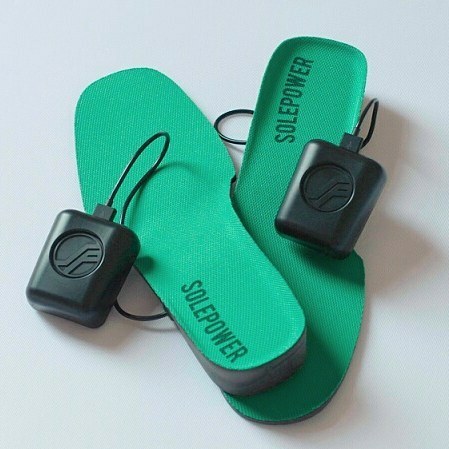 SolePower was launched in 2012 after the idea arose from a design project at Carnegie Mellon University where Alexander and her fellow classmates were asked to solve a problem for students. They decided to create shoes with lights to make it easier for people to see in the dark. After researching the project, however, Alexander realized the shoes could harness other types of energy. So, SolePower was born. What’s the difference between a beer can and a mayonnaise jar? It sounds like the opening to a bad joke, but it’s also the basis for a legal and regulatory battle being waged between the Texas Alcoholic Beverage Commission (TABC) and an Austin-area small business.Cuvee Coffee is a coffee bar located in a hip area of east Austin. Founded by Michael McKim, Cuvee’s sells beer on tap. Customers who want their beer to-go can have them placed in a growler (a large resealable bottle) or using a crowler (a machine that seals the beer in an aluminum can with a standard pop top). It takes several minutes to produce a can of beer using a crowler and, because the device doesn’t eliminate oxygen from the can, the beer won’t stay fresh for as long as canned beer bought in stores. As such, crowlers are useless as a way to mass-produce canned beer.Texas law requires businesses that wish to “bottle and can beer and pack it into containers for resale” to hold a manufacturer’s license from TABC. Texas also prohibits the same entity from holding licenses for both the manufacture and retail sale of alcohol. Dating from the years after Prohibition, this mandatory separation is argued to be needed to combat organized crime. In practice the rules often serve to limit competition. (NEWSER) – Perhaps you know someone who’s written his name in snow, you know, with urine. That’s essentially what some fish do every day. In a study titled, “To pee or not to pee: urine signals mediate aggressive interactions in the cooperatively breeding cichlid,” researchers explain that urination for the cichlid fish is not only a bodily function but also a form of communication, per Science. To figure that out, they injected the fish with a dye that turned urine blue, then measured a fish’s urine while it was kept separate from other fish. Researchers then placed a larger cichlid and a smaller cichlid in the same tank, separated by a transparent barrier. When the fish spotted each other, they swam toward the barrier in an aggressive manner with fins raised and peed. Short Bytes: If you’re searching for a YouTube alternative, BitChute is a people-powered video streaming website. To host a video, it takes help of the web browser-based client WebTorrent which uses peer to peer file sharing over the BitTorrent network. At this time, BitChute has limited features, but it wants to become a platform freer than websites like YouTube. YouTube might be the biggest video sharing platform in the world, but there is a lot of hanky-panky content hidden behind YouTube’s curtains. Also, its censorship filter – to please the governments – has made things uneasy for the people creating videos on sensitive topics. It is hard for them to leverage YouTube as a monetization platform in comparison to other content creators. BitChute is an attempt by Ray Vahey to provide a video sharing platform that’s free from censorship. The best thing is that BitChute, using WebTorrent, works in a P2P fashion over the BitTorrent network, eliminating hardware and high bandwidth costs. WebTorrent is a BitTorrent client developed by MIT. It works inside the web browsers and requires no installation. (NEWSER) – Charlotte McCourt has sold more than 15,000 boxes of Girl Scout cookies in a manner so unconventional it’s making news: The 11-year-old has been unflinchingly honest. Trefoils? “Kind of boring.” Toffee-tastic? “As flavorless as dirt.” Savannah Smiles? “Divine.” (Not all were negative.) Charlotte, a New Jersey sixth-grader, was dismayed that only two of the boxes she had sold were marked to be donated to US military troops, so her father suggested she write a letter to a wealthy family friend who might be willing to donate a bunch. The result? A letter that described each cookie in brutally honest terms, including demerits for “blandness” to Do-Si-Dos. “I played it by ear and I just kept typing until I thought the letter was good,” Charlotte tells ABC News. The wealthy friend did indeed send 25 boxes of cookies to the troops, but it was a Facebook post that made Charlotte’s cookie sales hit warp speed. Short Bytes: Cryptkeeper is a popular Linux encryption application that’s used to encrypt your valuable data. But, it’s not as safe as you think. A bug has was recently discovered that allows universal decryption using a single letter password “p.” Debian developer Simon McVittie has advised the dev team to take it out of Debian altogether.Encryption apps are supposed to act as an extra, solid layer of security for protecting your data. But, what if the encryption app installed on your operating system is not as safe as you expect it to be? A developer, recently, made a similar revelation.Cryptkeeper is a popular Linux encryption app that, surprisingly, allows universal decryption using a single letter password “p.” This Cryptkeeper version with the flaw was found in Debian 9, which is currently in testing. Developer Kirill Tkhai discovered the flaw.The Debian developer Simon McVittie writes that it might be happening due to an adverse interaction with encfs’ command line interface. With a simulated pressing of “p”, Cryptkeeper envokes encfs and sets the passwords to just “p” letter. As open source-powered hardware like Arduino and Raspberry Pi becomes more and more mainstream, its cost keeps dropping, which opens the door to new and innovative IoT and STEM applications. As someone who’s passionate about both, I’m always on the lookout for new innovations that can be applied in industry, the classroom, and my daughter’s robotics team. When I heard about the Orange Pi as being a “Raspberry Pi killer,” I paused to take notice.Despite the sour sounding name, the Orange Pi Zero intrigued me. I recently got my hands on one and in this article share my first impressions. Spoiler alert: I was very impressed.Why Orange Pi?Orange Pi is a family of Linux-powered, single board computers manufactured by Shenzhen Xunlong Software Co., Limited, and sold on AliExpress. As with anything sold on AliExpress, be patient and plan ahead for shipping times of two to four or more weeks, because the products are shipped directly from mainland China to locations around the world. A tiger has been shot dead after a man who climbed a fence into the tiger enclosure to avoid paying for a ticket was mauled to death at a zoo in eastern China.The attack was captured on camera and shared on social media, with one video showing a tiger gnawing on the man’s body as people screamed.A local government statement said the victim, identified only by his surname of Zhang, climbed a fence with a friend instead of buying tickets, at a resort in Zhejiang province on Saturday.The statement said Zhang’s wife and two children, and his friend’s wife, bought tickets to enter the zoo.But Zhang allegedly passed through a wire netting and eventually climbed a wall to enter the tiger enclosure while his friend stayed back, the statement said. PULITZER PRIZE-WINNING journalist Seymour Hersh said in an interview that he does not believe the U.S. intelligence community proved its case that President Vladimir Putin directed a hacking campaign aimed at securing the election of Donald Trump. He blasted news organizations for lazily broadcasting the assertions of U.S. intelligence officials as established facts.The Intercept’s Jeremy Scahill speaks with Seymour Hersh at his home in Washington, D.C. two days after Donald Trump’s inauguration.Hersh denounced news organizations as “crazy town” for their uncritical promotion of the pronouncements of the director of national intelligence and the CIA, given their track records of lying and misleading the public. In my nightmares, I’m eating an energy bar. I unwrap it, scarf the whole thing down, and then come to the instant, heart-stopping realization that I have just poisoned myself. I thought for sure I checked the label—I always check the label—but it doesn’t matter now because I’ve already swallowed. The gluten is already in my system.This is when I wake up.I know that it sounds melodramatic, even paranoid. I also know that if you experienced blinding pain, a gastrointestinal meltdown, and lasting internal damage every time even a smidge of gluten passed through your lips you’d be paranoid too. You’d pepper your waiter with questions about what exactly is in that sauce and hesitate to trust his casual “I think it’s fine” response. And if you had a way to check whether that waiter actually knew what he was talking about, you’d probably take it. If only for the vindication. Fairmount, NY — The insurance company for a Dunkin Donuts on West Genesee Street in Fairmount has agreed to pay $50,000 to a 12-year-old boy who ate a “foul smelling” doughnut 5 1/2 years ago.A settlement agreement filed this month in state Supreme Court says the boy’s mother purchased the doughnut on Aug. 25, 2011. The boy was 7 years old.The cashier acknowledged that the box of doughnuts smelled bad, but the boy had eaten one by that point.A day later, while at the State Fair, the boy started having facial tics and eye twitching. He was taken to the Upstate University Hospital emergency room to rule out seizures and later released.In the next few days, he saw his pediatrician and a neurologist. Neither of them found anything that appeared to point to lasting damage. While I did predict that “The USA are about to face the worst crisis of their history” as far back as October of last year, a month before the elections, I have to admit that I am surprised and amazed at the magnitude of struggle which we see taking place before our eyes. It is now clear that the Neocons did declare war on Trump and some, like Paul Craig Roberts, believe that Trump has now returned them the favor. I sure hope that he is right.Let’s look at one telling example:US intelligence agencies are now investigating their own boss! Yes, according to recent reports, the FBI, CIA, National Security Agency and Treasury Department are now investigating the telephone conversations between General Flynn and the Russian ambassador Sergey Kislyk. According to Wikipedia, General Flynn is the formerDirector of the Defense Intelligence AgencyJoint Functional Component Command for Intelligence, Surveillance and ReconnaissanceChair of the Military Intelligence BoardAssistant Director of National IntelligenceSenior intelligence officer for the Joint Special Operations Command. Source: Obama Killed a 16-Year-Old American in Yemen. Trump Just Killed His 8-Year-Old Sister.